Give your kid's room the ultimate ambiance with this Dora the Explorer Room Curtains! A perfect solution for humdrum windows, this pair of adorable room curtains offers a beautiful fit and classic look at an affordable price. It is well-designed for easy sliding on and hanging as a rod pocket curtain. Keep the undesirable dust and ultraviolet rays away from your kis! 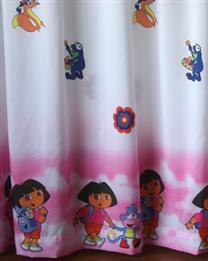 Cartoon Dora pattern curtain will surely make your kids' room cuter. It keeps hard light out effectively as well as makes sure your kids' rooms have enough light at the same tome. Made of high quality material, the kids curtain is durable enough for long time use.